I grew up in a house with a cold room in the basement, that brilliant cold storage concept that got forgotten sometime during the post war building craze. As a child I didn’t much like putting my hands into crates of potatoes in a dim room at the foot of the basement stairs, but I didn’t mind being sent down to choose a bottle of jam or pickles. The shelves were filled with strawberry, strawberry rhubarb, and raspberry jam, cranberry chutney, spiced currants, crab apple jelly a beautiful blush of clear pink, zucchini relish, mustard pickles, pickled beets and my favourite, Lady Ashburnham pickles. There were huge mason jars of dill pickles and my dad’s favourite, chow chow made with green tomatoes. All of this stuff wasn’t necessarily labeled and in that dim room it was often hard for young eyes to discern the difference between a jar of strawberry jam, and say, a jar of cranberry chutney. You believe that everyone has a cold room with old wooden shelves that sag under the weight of preserves by the time November arrives. You assume that every child arrives home from school in October to the sinus-clearing scent of cider vinegar simmering on the stove and tins of liquid paraffin in a water bath that you could dip your fingers in to make finger molds. You know that crab apple jelly only tastes good when there is no strawberry or raspberry jam left in the house. You have accidentally made (and eaten) peanut butter and cranberry chutney on toast (or some other unlikely combo). There was the time that we bottled zucchini relish when it was too cool so the canning tops didn’t seal and we had to store it all in our fridge. There was the time we made dill pickles and the garlic cloves turned blue. These days my preserving is limited and I’m happy to receive homemade preserves as gifts, but one preserve I make faithfully year after year is cranberry sauce (mostly because it’s so easy but also because I love it with winter squash and root vegetables). It adds a lovely dash of colour and a bright flavour to the sometimes drab-coloured plates of winter food. Even better, local cranberries are abundant in New Brunswick and easy to find at local markets. 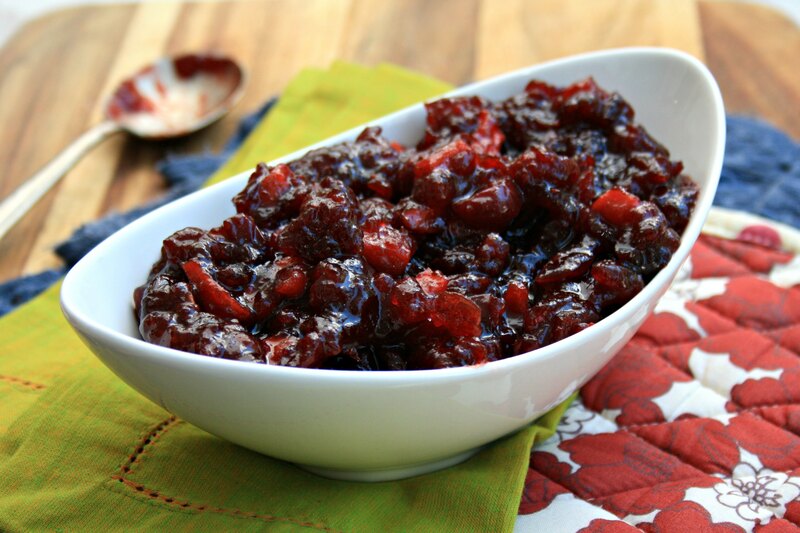 I know there are a million recipes out there for cranberry sauce but this is my all-time favourite. It’s slightly adapted from Craig Claiborne’s timeless The New York Times Cookbook. My adaptation — I swapped out some of the white sugar for molasses which deepens the flavour and works beautifully with the spices. The spicing is light so you still get that bright flavour that makes cranberry sauce so wonderful on a plate of heavy food. You can omit the spices altogether, if you prefer (it’s still yummy). In a medium pot combine the cranberries, sugar, molasses and apples. Cover and place on medium heat, stirring from time to time. Bring to a boil and cook for about 10 minutes, stirring often. Uncover, turn the heat down to a simmer and cook another 15 minutes. The mixture will thicken as it cools but cook it a little longer if you prefer a thicker sauce. Store in the refrigerator (tis cranberry sauce will last for at least three months) or preserve in canning jars. 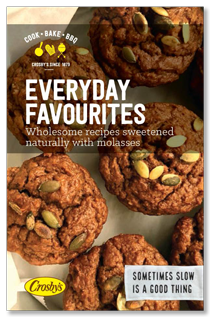 The Canadian Food Experience Project began June 7 2013.  As we (participants) share our collective stories through our regional food experiences, we hope to bring global clarity to our Canadian culinary identity. Roasted root vegetables recipe with molasses cider glaze is easy and impressive. Sometimes I aspire to be a bit like Martha Stewart; to take the time and attention to set a stunning table or arrange charming seasonal decorations outside the front door. My entertaining energy goes into creating a great meal and then relaxing to enjoy it with friends. Every once in a while a dish comes along that by its very nature has that “Martha” look, and gives the appearance that you have outdone yourself, with really not a lot of effort. This is that dish. And in spite of the number of steps listed below, it’s pretty easy. Combine apple cider and brown sugar in a small saucepan over medium high heat and simmer until it reduces to about 1/2 cup (15-20 minutes). Be careful not to overdo it. Remove from heat, add the molasses. Set aside. Place your choice of root vegetables, along with the apples, onion, garlic and herbs, into a large bowl and toss with 2-3 tablespoons of olive oil and the sage or thyme. Turn your mixture out onto a large baking sheet or pan lined with parchment paper. Rub the inside of the squash, and the flesh side of the “lid”, with olive oil and season with salt and pepper. Place it on a baking sheet, flesh side down. Put both pans in the oven and roast at 400 F until tender and starting to brown a bit. About 25-35 minutes. Melt the butter (or warm oil) in a small pan over medium heat. Add pumpkin seeds to the pan along with the chili powder and toss with the butter. Toast gently until they start to pop, stirring them around in the pan to ensue nothing burns or browns too much. Remove from heat and stir in the cranberries. 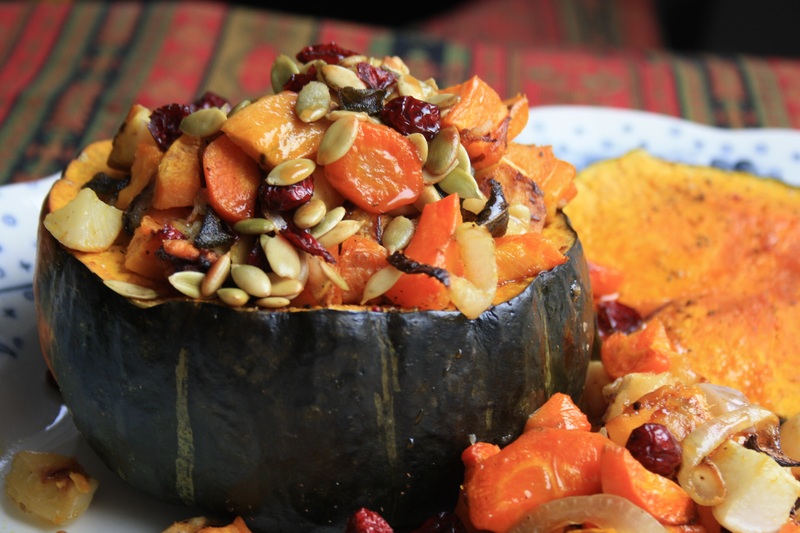 Place roasted quash on a warmed serving platter and fill with the roasted root vegetables. Pile extra roasted vegetables alongside the squash. 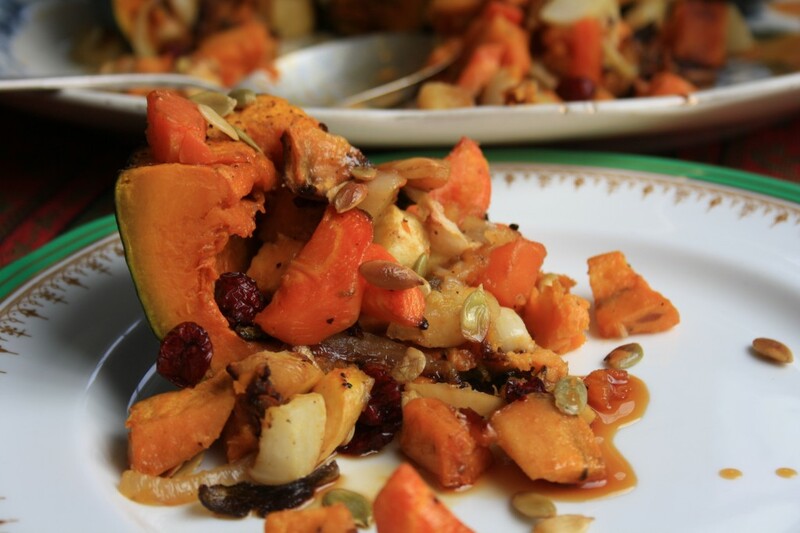 Pour over the cider glaze and sprinkle with the roasted pumpkin seed cranberry mixture. To serve, slice squash into 4-6 wedges and plate, scooping up some extra root vegetables.